In Kapu Forest HD, as your child goes through the forest they will come across animals that need assistance with various tasks. One of the first presented, is a woodpecker. Once they tap the woodpecker, trees close and open, and the app zooms in on the scene. If the child continues to tap on the woodpecker, the bird is able to make a hole in the tree. Your child is rewarded with a cute little, visual display with sound, including the sound of children’s laughter. This repeats every time they complete one of these tasks! The challenges in the forest depend on the animal. The way your child helps the beaver, for example, is by way of doing a puzzle, so he can complete his dam. Another example of a task to be completed is helping clouds make rain, so that carrots can grow for a pink rabbit. One last is sorting different colored mushrooms into the correct baskets. There are more challenges that vary by animal! These are fun games for a young child! If your child taps the small red, picture of a parent holding a child’s hand in the upper left corner of the home page, either you or your child can link to another app by this developer, set a timer for the length you want your child to play this app, monitor the length of time they are playing it, download wallpaper, select a language (English, Russian, Finnish, German, or Spanish), access terms, support, and link to the website, like the app on Facebook, and rate the app on iTunes. Also on the the home page, the music can be turned by pressing the little musical note on the bottom left. 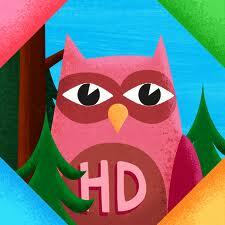 This is a neat, fun, and brightly animated app for young children. I believe they will have fun helping the animals in the forest. It is not a very long app, but young children will play what they like, again and again. The puzzle, easy maze, tasks that have your child assisting animals getting food or eating are all good for developing fine motor, motor planning, and problem solving skills. What is better than developing these skills while having fun? Kapu Forest is a colorful and fun digital toy for kids aged 1-4+. Let them discover the forest and meet all the animals through one of more than 10 mini-toys available. In Kapu Forest there are no timers, no limits and no high scores. Your kids have complete control and can explore whichever toy they want to. They’ll never be stuck on a level and always have fun! Requirements: Compatible with iPad. Requires iOS 4.0 or later.